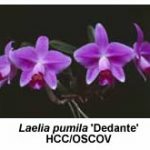 In general, the following six species have smaller flowers than those described in the previous article but they are by no means less worthy of a position in any mixed collection of species orchids. In my experience the last four grow and flower better for me in a ‘cosy’ shade-house than when grown in the glasshouse under intermediate conditions. Pholidota chinensis, a native of China and Burma, may be grown under either cool or intermediate conditions. The inflorescences develop from the centre of the new growths in early summer if grown in the shade-house, soon becoming pendant and providing an attractive floral display if the pot is suspended from the shade-house roof. Each inflorescence is said to bear as many as 35 green/buff-coloured flowers but my plants bear fewer flowers when grown without heat. The new growths appear in late winter but take many months to develop. A small plant takes only a few years to develop into an attractive specimen. 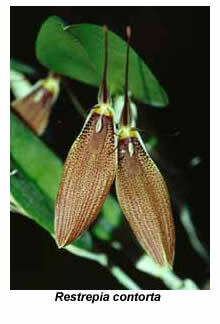 Restrepia ephippium (syn. R. helmsleyand), characterised by its prominent fused lateral sepals, is one of at least thirty species in the Central and South American genus Restrepia. It grows well under the same conditions as masdevallias and other pleurothallids, namely, its potting mix should be kept damp at all times. The flowers emerge singly from the back of the leaf at the junction of the stem and its leaf; up to five flowers are produced in succession each season, the second appearing only after the first has fallen. R. ephippium has red flowers, while the related R. trichoglossa has smaller, yellow flowers and R. contorta has larger, orange-brown flowers. Pleurothallis truncata grows under similar conditions to the above restrepias. 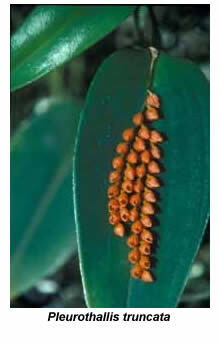 While its inflorescences also emerge from the junction of the leaf and stem, they lie on the upper surface of the leaf. 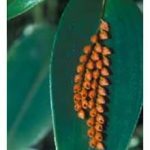 Each inflorescence bears up to twenty small, bright orange, tulip-like flowers, well grown plants bearing two inflorescences per leaf. The flowers usually open in early spring and last for three or four weeks. 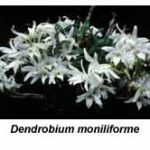 Dendrobium moniliforme is one of the so-called ‘soft-cane’ dendrobiums, and was used extensively in the early hybridisation of soft-cane dendrobiums. 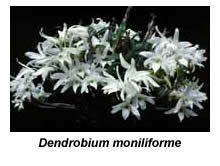 A native of Japan and Korea, it can withstand cooler conditions than most other dendrobium species. 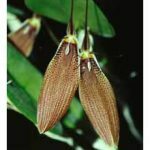 If kept fairly dry during winter, Dendrobium moniliforme flowers profusely from the nodes of its leafless canes, usually producing two pale pink or white flowers per node. 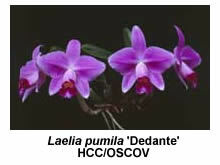 Laelia pumila (syn Sophronitis pumila) is one of the Brazilian laelias that have recently been transferred from the genus Laelia to Sophronitis on the basis of DNA evidence. Although L. pumila plants are much smaller than those of other Brazilian laelias, its flowers are quite large, measuring 100 mm or even more across. The rose-purple flowers, one or two per inflorescence, open in autumn and last in good condition for several weeks. 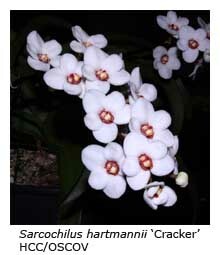 Sarcochilus hartmannii is usually found growing as a lithophyte in coastal New South Wales and Queensland, and I therefore grow my plants in a mix of pine bark and river pebbles, using a shallow pot. The crystalline white flowers, often with a prominent red centre, are produced in late spring. In order to minimise fungal spotting by Botrytis, I provide good ventilation and avoid wetting the flowers when watering. 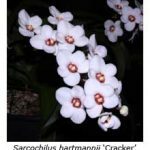 I prefer to grow my sarcochilus species and hybrids on a low wire-mesh bench, where the plants receive more shade and higher relative humidity than most of my other orchids.